It's Wednesday morning, September 24th to be precise, and Tom Jarrell is in love. He's walking through the tree-covered streets of Daytona Beach, on his way to work, and thinking about the wonderful night he just spent. But, when he gets to the office, he realizes he has a few things that need to be done. For one, he needs to file an affidavit in a murder trial, but he's never done any such thing, so he heads off to his old law school to meet with his favorite professor from before the war to get some much-needed advice. And, while there, he gets much more than he was expecting. Meanwhile, Ronnie Grisham is in trouble with his landlady. He hasn't slept in his boarding house bed for two nights and she just read her cards last night. Change is coming. Could the cards be pointing to Ronnie? As for Marveen Dodge, her suspicions about what is really going on at the law office of Tom Jarrell, Esquire, is like a simmering pot that could boil over at any moment. And, Alice Watson is doing just fine, thank you very much, and looking forward to a nice Saturday at the beach with her girl. 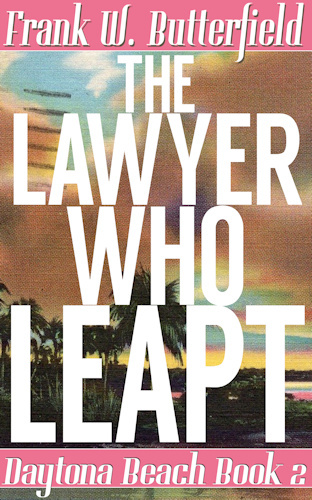 Read about all of this, and more, in the case of THE LAWYER WHO LEAPT. Welcome to a gay twist on Perry Mason! Set in the sultry south and by the beach, the Daytona Beach series of novels are about Tom Jarrell, an attorney who's just starting his own private practice, and Ronnie Grisham, Tom's private eye, long-term friend, and new-found lover. These stories begin with Tom and Ronnie finding each other after a devastating loss and continue as the two men bring together a kind of family that neither of them could have ever imagined having. Come take a stroll along the World's Most Famous Beach right after the Second World War. Truman is president, the men are home from Europe and the Pacific, and the Red Scare is just getting started. It's a time and a place that no longer exists. Take a dive in and see if you might wanna stay for a while.